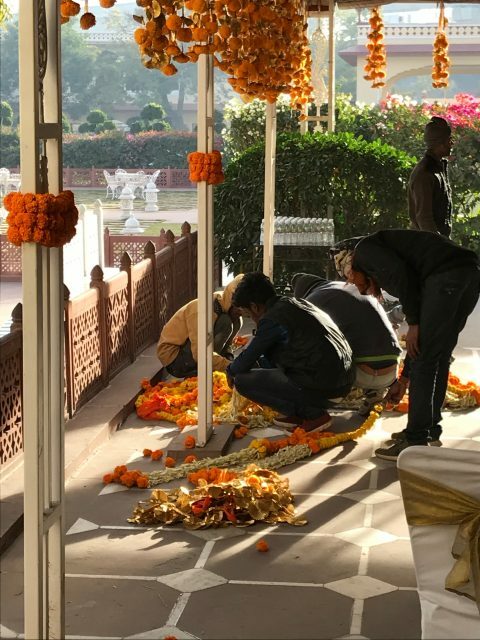 These workers were making and hanging garlands of marigolds around the hotel for the wedding. There was lots of activity going on at our hotel yesterday as we prepared to check out – a BIG wedding ceremony would be taking place in the evening, and workers were all over the hotel and grounds getting decorations and all in place. Also, peacocks could be seen roaming the grounds. It was apparent the wedding was going to be quite a lavish affair. 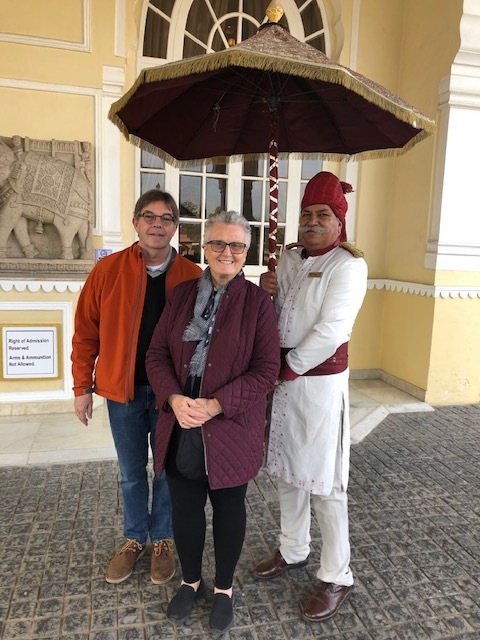 We were treated like royalty during our entire stay at the Jai Mahal hotel. Heading out for our last day in India with our travel partners Amy and Phil, and our wonderful guide, Luke (real name Lokendra). We learned yesterday morning too that the hotel, the Taj Jai Mahal, was at one time an actual palace owned by the local ruling family! In fact, the royal family still owns the property and the Taj hotel group leases it (and renovated it) to use as a hotel. 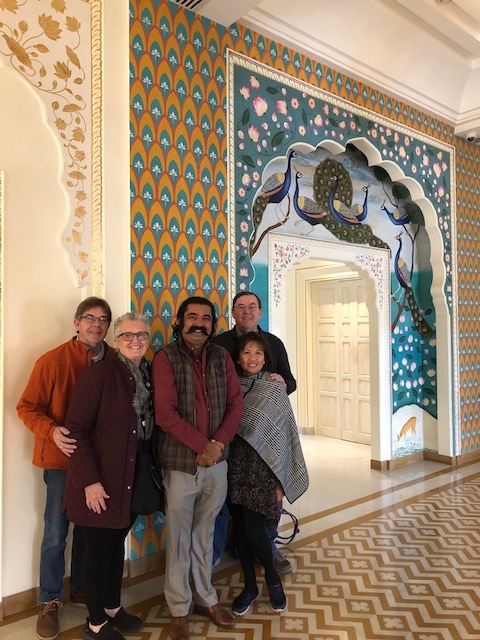 Our first stop of the morning was the Jaipur City Palace, owned and currently lived in by members of the local royal family (the same family that owns the Jai Mahal property). A few of the buildings in the palace have been opened to the public, and a few operated as museums. The palace was yet another hidden gem – the outside wall gave no indication of the eye-popping splendor inside. The largest sundial in the world inside the Jantar Mantar. The observation tower at the top was used by astronomers only once or twice a year. 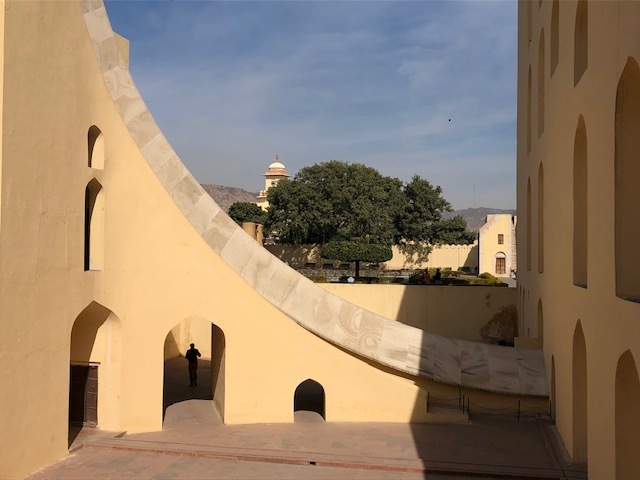 The second stop of the day, Jantar Mantar, the Jaipur observatory, was another surprise, and one of the most fascinating places we visited on our tour of India. 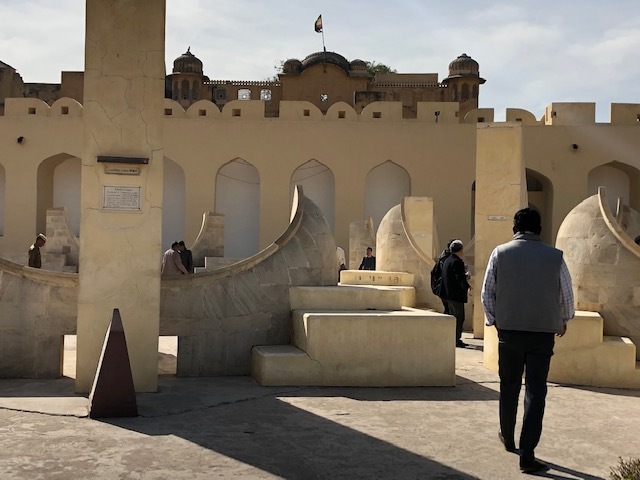 Completed in 1734, the observatory was built by the Rajput king Sawal Jai Singh II, who had deep interests in astronomy, mathematics and astrology. 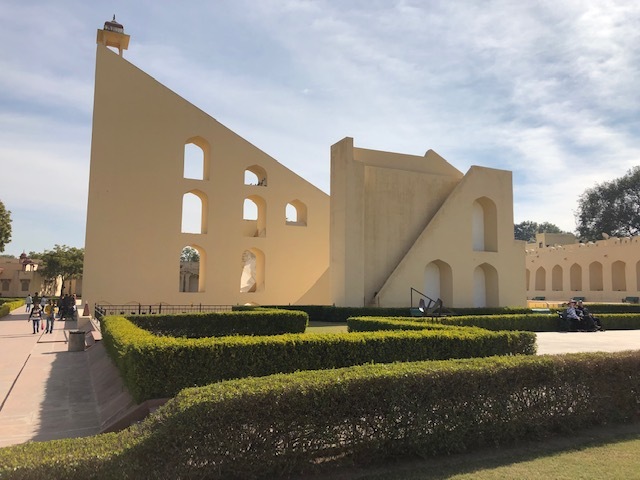 The observatory houses the largest sundial in the world, still accurate to two seconds, and the entire observatory is a UNESCO World Heritage site. Beyond the sundial the observatory also houses several other astronomical and astrological structures, including twelve individual astrological instruments that were used to calculate individual horoscopes. Horoscopes remain important in Hindu culture – for example, according to Luke, each person has 36 astrological attributes based on the date, time and place of birth, and for a good Hindu marriage match a couple should share at least 18 of the attributes. Our little group hired a local astronomer to walk us through the observatory and explain it all. I found it fascinating, particularly the continuing accuracy of all the instruments considering they were built from stone and marble and without the help of technology nearly 300 years ago. The a.m. side of the sundial. Walking through some of the twelve astrological instruments. Our next stop of the day was lunch at a nearby hotel, where our group enjoyed butter chicken and lots of naan bread for our last meal together. After lunch we had planned to go visit the monkey temple complex, but Jaipur traffic got the better of us and we instead ended up going to the airport to check in for our flights. Phil and Amy were continuing on with Luke to visit Udiapur and Mumbai, while Brett and I were flying back to Delhi where we’d catch our late-night flight to Hong Kong. Checking our bags at the Delhi airport. Travel days are never fun, and this one was another that tried our patience. Getting out of India turned out to be a lot more difficult and unpleasant than it had been getting in to the country. We had to pay overweight fees equaling $95 in Jaipur even though Luke tried to get them waived, but the airline would not budge. Also, our flight from Jaipur ended up departing nearly an hour late, and we learned on arrival in Delhi that although Indians are great about politely forming and standing in a queue before departure, it was no holds barred when it was time to get off the plane! We eventually were able to get off the plane, collect our suitcases and head up to check in for our flight to Hong Kong. 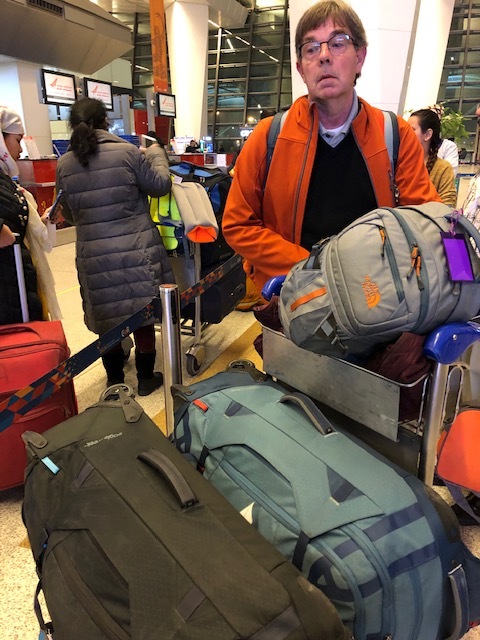 I don’t think we’ve ever been so glad that we had a long layover like the one we had in Delhi because airport security put us (and many others) through the wringer and with less time we would have missed our flight. I’ve never experienced anything like what we went through there and never hope to again. We followed the usual rules for taking out our laptops and tablets, etc. – there were no signs to tell us exactly what to do but we watched what others were doing and followed their example. After sending my backpack and other items through the x-ray, I walked through the scanner and was pulled aside for an additional check. I showed the female security guard my neck wallet that I use for my passport and credit cards and she took EVERYTHING out and went through each one of my credit cards and pieces of ID before returning them to me – crazy! Then I went to get my backpack and other things but for some reason security thought I had a knife in my purse (!) so I first had to empty that completely, and the “knife” turned out to be my keychain, made from the handle of an antique silver spoon. Then the security guys didn’t like what they saw in my backpack (I have no idea what they thought they saw), and they scanned it three times, ending up with taking everything out of my backpack and going through it all – jewelry, toiletries, medications, etc. Everything was left in a jumble in one of the plastic security bins for me to sort out. The guards were quite surly too, but eventually I got all my stuff together although it took a while to repack everything so that it all fit again into my backpack and purse. Needless to say, Brett got the same treatment. We left security feeling frazzled and beaten down only to discover we had a near 15-minute walk to our gate. We learned today via Luke that not only was yesterday a holiday in Delhi, but the city had received a threat from Al Qaeda right around the time we were going through security, so no one was taking any chances. Still, it was a miserable experience. Our flight finally took off around midnight, an hour late, but we had a comfortable flight (although little sleep) and still managed to arrive on time in Hong Kong at 6:30 this morning. We collected our bags, got through immigration and then searched for an ATM to get some HK$ before heading to our hotel. Brett was completely exhausted and drained at that point, and not only did he miscalculate and withdraw way too much money, he also left (and lost) his debit card in the machine! So, the first thing he had to take care of after our hotel check-in was to contact our bank and freeze his card (he won’t be able to get a new one either until when we’re in Japan). Thank goodness I still have my card or we’d be in serious trouble right now. For what we paid to have our laundry done in our hotel, it deserved being delivered in more than a wicker basket! Once we got that issue taken care of, our next step was to get our clothes sorted and sent to the laundry. There had been no time to get laundry done the last few days in India, and both Brett and I were running out of clean clothes. We were shocked though by the laundry bill that came back for five days worth of clothing for two people: $230 dollars (US, not Hong Kong)! That definitely was an unexpected expense, but we were in a tight spot as far as needing clean clothes. Lesson learned though – Hong Kong these days is EXPENSIVE. 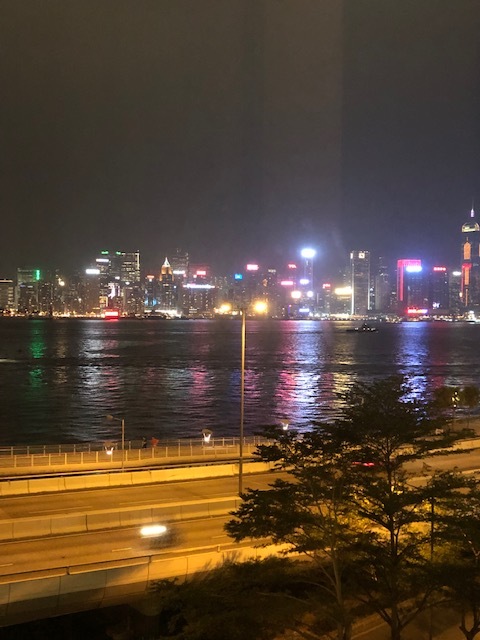 A view from our room of the Hong Kong harbor and skyline. Our hotel room is lovely and comfortable though, and we have a drop-dead view of the harbor and the Hong Kong skyline which is what we wanted here. We slept for around five hours today our of pure exhaustion, and had dinner this evening at the hotel coffee shop. Afterwards we went out and walked around for a bit to try to get ourselves oriented. Everything had looked very, very different and unrecognizable this morning coming in to town, but once we started walking around we recognized many familiar streets and shops and now know right where we are and how to get around. The city is gearing up for the biggest holiday of the year, the Lunar New Year (February 5) and fabulous decorations are already everywhere. We only have four full days in Hong Kong and want to make the most of them. Tomorrow’s plan is to head over to the Hong Kong side of the harbor and ride the tram up to the Peak, and then hopefully eat roast goose for lunch as well as pick up some tasty egg custard tarts before riding the Star Ferry back to Kowloon. After that, who knows? It’s good to be back though. I am sorry the airport was such a mess. Did you know there was a major attack in Nairobi yesterday? I understand that it shook a lot of places. How I miss Hong Kong. The walk around the top of the peak, the double decker out to our house in Pok Fu Lum and the dinners in Repulse Bay. I am anxious to hear if many of those things still exist! I taught at the Hong Kong International in Repulse Bay. Our ahma (and old friend) lives in Causeway Bay. I am sure she could have hooked you up for laundry.That is an outrageous amount to pay. My daughter in law’s brother works in midtown. There is a chance we will all go over in a few years. Again, your trip report should give me insight as to whether I should go or not. Once we heard about the threats (and later about the bombings in Nairobi) all the extra security made sense. But at the time we had no idea what was going on, and it seemed very disorganized and discretionary. We did notice that others were getting similar treatment (we were in the “foreigners” security line). Hong Kong seems the same and yet very, very different. I have to admit being sad about the old China Fleet Club no longer being around, but the navy doesn’t stop here much these days. Repulse Bay is geographically there although the hotel is long gone. They tried to keep the restaurant going for a while but that never worked out. There are just so many more buildings, high rises, etc. now, the skyline is vastly different, and yet down on the ground things seem the same. But, it’s so very, very expensive now compared to the past, shockingly so in some cases (like our laundry). Our good friend from Portland arrives in town today – she could have probably gotten us a better deal on the laundry as well. Oh well – we were somewhat desperate for clean clothes and had to use what was available. We are planning to take the double decker bus over to Stanley on Saturday (riding up top in front, of course) – always a fun trip. Today we’re heading over to Central to visit the Man Mo Temple, eat roast goose and egg tarts, and ride up to the Peak. We’re taking the MTR over to Central, but riding the Star Ferry back to Tsim Sha Tsui, and if we’re hungry we plan to eat at Dan Ryan’s in Ocean Terminal tonight. Coffee and pastry at Starbucks for this morning’s breakfast was about $24US; we used to be able to eat for around $3US. So sorry to hear about your travel day. I’m not excited to deal with the logistics tomorrow both in the US (TSA issues) as well as what will likely be quite heightened security in Japan. I can’t remember if you’ve mentioned this before, but we had a team activity yesterday in Tokyo that I thought you might enjoy checking out when you’re back. It was a really fun/interesting experience. The travel day was miserable, but made much more sense once we knew what had been going on in the world, and that threats had been made. Our girls are traveling today and tomorrow in the US and I’m worrying about their trips because of what’s going on with TSA. I’ve heard about the art immersion experience in Tokyo – would love to hear your impressions since you’re the first person I know who’s actually done it. Team outings are a BIG thing in Japan (the English class I held used to travel together around the country as a team effort), and this one sounds quite unique. I went into it with zero expectations, which is usually a good thing. It was basically like a full senses art exhibit. You walk through & the lights, sound, temperature & water changes & you become part of this very lovely & visually interesting settings. I was also jet lagged, so I almost fell asleep on the ground at one point! I don’t know how much it costs (although, I suppose I will see an expense report soon), but thought it was really different & creative. I also thought it was very relaxing. We sailed through security at LAX on Tuesday, and TSA seemed in good spirits. Passengers, us included, were bending over backward to thank them, and it seemed to be helping. Ironically, we are now in DC, the belly of the beast! Hong Kong is high on my list of places to visit, and I am taking note of how expensive it is, so thank you for that. We visited London back when the pound was equal to $2 USD, and still joke today about our $6 coffees each morning. We lost weight on that trip! Wow! That is an amazingly expensive city. I wonder how much that laundry would have cost you back in India. Enjoy your time in Hong Kong! We would have paid less than half that amount in India for the same amount of clothes. We are discovering that while some things here are now VERY expensive, other things are not and are even very inexpensive still. So, it’s not all bad. 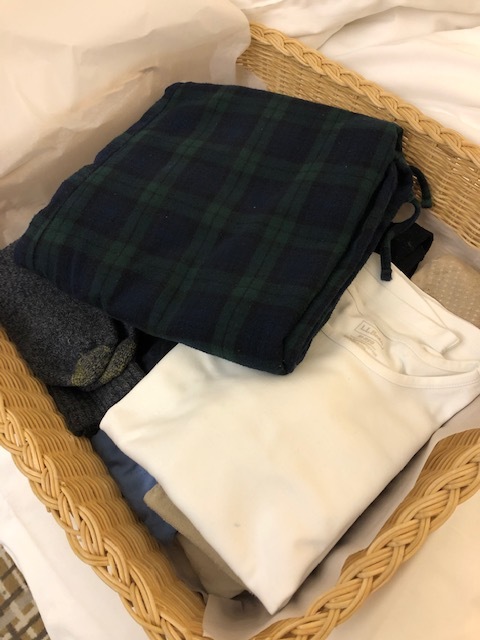 But the laundry expense was outrageous – lesson learned! The peacock gate is stunning. I’ve loved your photos of India and the commentary. Thank you for sharing. The travel day sounds horrendous. It’s so easy to make mistakes when one is tired & overwhelmed – like leaving the debit card – what a bummer. Sounds like a marathon of a trip from India to HK. I lived in WanChai in a tower built over the conference center and had a gorgeous view of the harbor and airport (old). Sadly I understand all was taken down and rebuilt. Have fun enjoying the energy of this world-class city! The peacock gate was one of those places where all four of us walked through, turned around and gasped. One of the things I enjoyed most about our visit was that for so many places, from the outside you could not imagine the beauty that was contained inside. We were surprised so many times. We understand now why security was so intense that day, but at the time it was hard to know what was going on or why. The flight itself wasn’t long, but everything around it was hard and made for a very difficult travel day. Lucky you to have lived in Hong Kong! WanChai has changed the most for us – it’s barely recognizable (to us) now. There are so many more high-rise and other new buildings than before, but the harbor has been filled in quite a bit too – Kowloon side and Hong Kong now seem so close together compared to the past. But it’s still Hong Kong on the inside! The new airport is very nice, but I confess to missing that exciting approach into Kai Tak!